Brilliant Bathrooms and Kitchens did a fantastic job, highly recommended. Pleasure to have been of assistance Kris. All the best with your future plans!! Silvio is a champion. 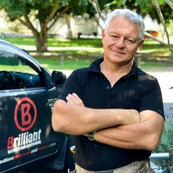 He is not just a skilled tradesperson, but a thoughtful, creative planner and an honest, amiable professional. Relationship: Silvio was mentioned to me by my Golf Coach. Thanks for your kind words Marianne, it is always such a pleasure to do your work.